Dye Verse UK: Colour sells the goods…. I have spent the last few days with myself identifying what is important to me in an attempt to and prevent other’s agendas becoming indivisible from my own. The consequence of this? – I have ended the week a lot happier and more complete than when I started it. 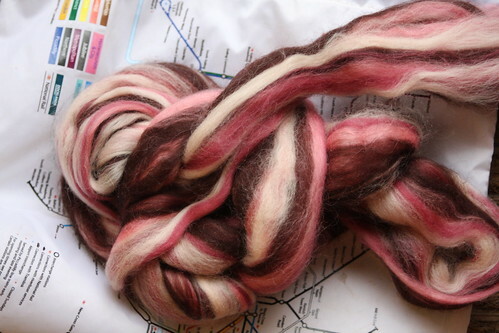 This is what is currently being spun on my Dorcas (my Ashford Traveller). 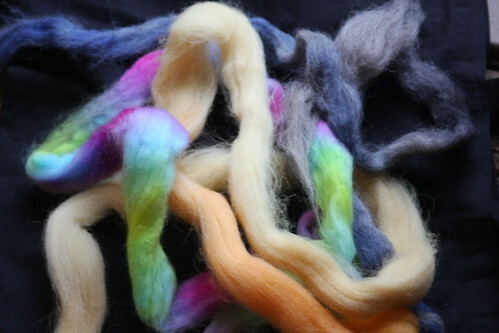 The top photo, a selection of 20 g Fibreholics, and the bottom one 100 g from Sara's Texture Crafts. I have finished all my mitts, so they will go off to their recipients this week, but because of the rain have got a little distracted from my dyeing missions. This is the one waiting patiently in line from DT Crafts. 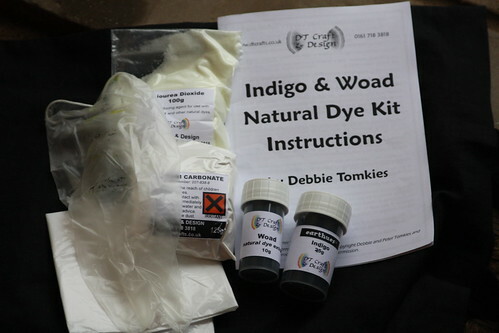 I just need to buy some odds and sod, the wool has arrived this morning, and I shall be making some test samples before launching into some commissions for 500g batches of DK. I have some weaving I really should be getting on with, as they are destined for presents for kind people, along with some painting and writing, more about the latter as the projects get underway. 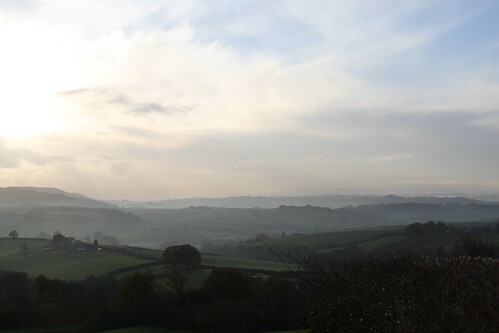 Yesterday, whilst searching for solitude, I found the perfect spot to inspire – just over the water in Wales. I just need to find a way to spend some quality time there, without baggage. It was lovely to take a day off from life. In recent months I have become acutely aware of how miserable some of the professional people that I am dealing with are, and this is draining as well as infectious and toxic. I picked up a book on my travels written by Elizabeth Chadwick entitled Shields of Pride. Last night I read the first 62 pages, and couldn’t put it down until the need to sleep forced the issue. I was sorry to read in the author’s note that publication of this novel from hardback to paperback had been delayed in 1994 because of problems with the Maxwell publishing empire. This meant that this particular book had eventually only been published in 2007. I find this quite bothering that commercialism can effectively prevent a really noteworthy book being read by the general public. This feels like some kind of censorship to me, and has made me wonder how many other excellent authors don’t even get into print, or have work waiting under contract (like myself) which will probably never see the light of day. I am not fussed, because I write for myself not my ego, but I can’t help feeling the reader is all the poorer for this. Still I have found her now, and my midget brain has been scratched to reveal distant memories of words such as Palfrey's and Destrier's. I do love the English Language, and this era in history which gave us sumptuous tapestries (without which there would be no point in visiting a NT property for me) and underpinned Chivalric conventions. So mind back on the tapestries, I shall leave you with this thought – taken from Natural Dyes and Home Dyeing by Rita J Adrosko.